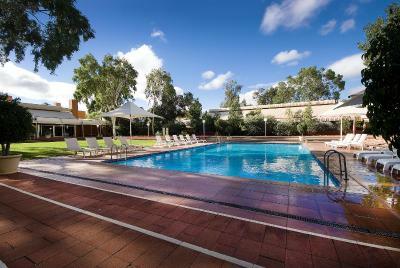 Lock in a great price for Desert Gardens Hotel - rated 8.1 by recent guests. Hotel restaurant was excellent. Segways were fun albeit expensive. Uluru and Olgas are well worth visiting. The location. The very helpful friendly staff including the cleaning staff. The system of obtaining daily room credit by maintaining your room is great. The total complex resort met all our needs. Out door complex free activities were conducted very professionally & informative. Would recommend even though the food & drinks were a little expensive. Nice place & clean. Didn't have the breakfast package but did have dinner which was fantastic. Location of the premises was great and close to city centre. Car parking good. Pool area was wonderful with a grassed area to use. Room was large and comfortable. The Hotel was located in close proximity to the the town square and the other venues. Our room was walking distance to the pool and the retaurant. It was clean and functional. The room was freshly painted. The staff were pleasant and helpful. The children enjoyed the pool to cool off after the day - there were plenty of pool towels available and sunloungers :) The housekeeping staff did a reasonable job and were happy to work around our schedule. The room was well appointed and attractive with a good view of the desert. The pool and gift shop were exceedingly nice. The staff was friendly and helpful. The staff and the food was awesome. Loved the authenticity of the experience and the location. We had a fabulous time, the accomodation was excellent, very comfortable and clean but the most important thing to me is always the people and your staff were fabulous, from the young girl who checked us in ( I have forgotten her name) to the young girl who looked after us at breakfast Stavroula. The grounds were clean and the pool area inviting with the lush green grass. The bar staff were fabulous, nothing was too much trouble. Thank you for having us. Did not have breakfast there. Too expensive at $42 per head. 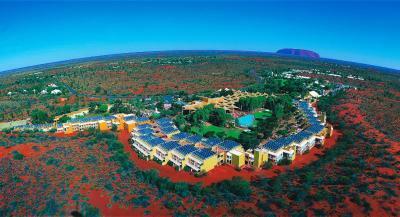 Desert Gardens Hotel offers air-conditioned rooms, some with a private balcony or views of Ayers Rock (Uluru). Guests can unwind in the outdoor pool, or at the restaurant and bar. Spa facilities, shops, tour information and cafes are conveniently located within a short walking distance from the property or via a free shuttle bus. 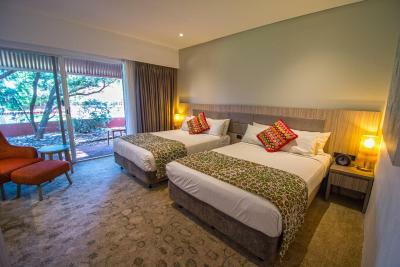 Set amongst native gardens, each room at Desert Gardens Hotel includes a minibar and tea and coffee making facilities. There is a TV with movies-on-demand in every room. The hotel's Mangata Bar serves cocktails that can be enjoyed while relaxing by the hotel pool. Arnguli Grill offers an a la carte menu of traditional Australian cuisine. The Uluru Lookout is just 0.9 miles from the property while Kata Tjuta (The Olgas) is a 40-minute drive away. 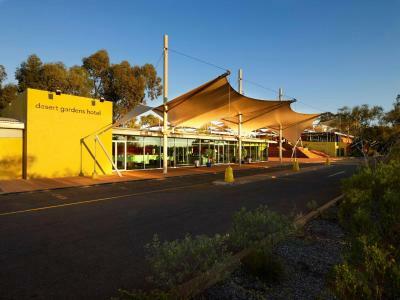 All guests staying at Desert Gardens Hotel receive free return transfers from Ayers Rock Airport (Uluru, Connellan Airport). This transfer service is available for this airport only. 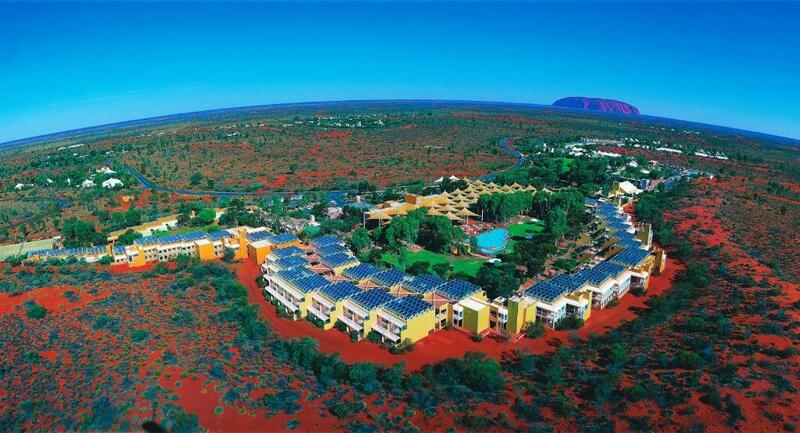 The hotel is only a 5-minute stroll to the lookout, where guests can view the desert sunset and Uluru. Desert Gardens Hotel has been welcoming Booking.com guests since 18 Jun 2010. When would you like to stay at Desert Gardens Hotel? Located throughout the gardens of the hotel with either a balcony or courtyard area, this air-conditioned room features TV with free-to-air channels and a minibar. 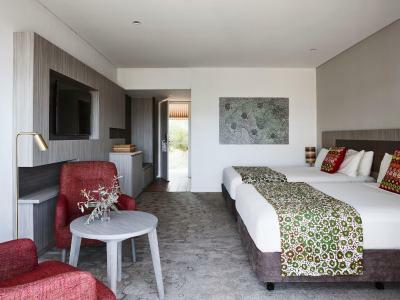 This spacious, air-conditioned room looks out on the desert landscape and feature either a balcony or private courtyard. Each has an en suite with a bath and a shower. 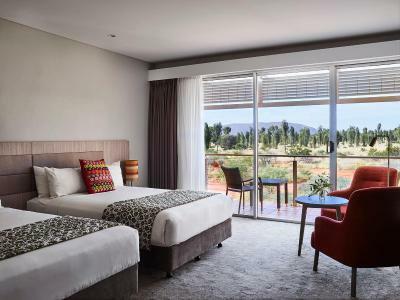 With panoramic views of Uluru (Ayers Rock), these rooms feature a balcony or private courtyard, plus a bathtub and in-room safe. House rules Desert Gardens Hotel takes special requests - add in the next step! Desert Gardens Hotel accepts these cards and reserves the right to temporarily hold an amount prior to arrival. The courtyard of our room was dirty and needed a complete tidy up. Was not at all pleasant to sit outside. The lights inside the unit had an unusual set out. To have the bathroom light on the hall way light had to be on which then annoyed anyone else who was trying to sleep. I would suggest when the rooms are next refurbished that you add a ceiling fan and a good security door onto the balcony and you would find a majority of customers would not require the air conditioning for a portion of the year. Much nicer to sleep without being dried up and looking like a prune in the morning :) and also cheaper to run. The bathroom was not as advertised on the internet with double basins …… . Plug is also leaking and does not hold water in the sink. Shower in bathroom is old and tired and could be difficult for the elderly. My elderly In-laws would not cope with this at all. (Shower over the bath situation). Overall bathroom needs to be renovated. Maybe one room at a time could be renovated with the above ideas. No drawers for clothes. Bedside tables with large drawers would fix this problem, as I like to unpack my clothes not live out of a suitcase. Existing bedside table drawer was impossible to open without the whole table moving. Very stiff to open. very long queue to check in. The garden & pool area were really nice. Given the room price of $500 per night, I would have expected a bit more comfort. The restaurant was limited in choices especially for those with dietary requirements, but overall the food was fine. Our room was near the pool so it was quite noisy if we left the sliding doors open - fine with them closed. No late check out. The accommodations were very comfortable. I liked the breakfast brunch very much. The room rate increased by $200 from what we signed up to pay. The room had NO closet and came with few toiletries. Also check out time was ridiculously early (10 am). The room was too small. We had a garden room with two double beds which was a little too small for two adults and two children. We stayed for 4 nights and felt like we were tripping over each other. Mr. Beau Rigbye, the receptionist. Polite, professional, respectfull and enthusiastic. He should be put as a Head of Training Department in every hotel chain all over the world. I travel alot, and I know what's good service. Thank you.